I have never liked Chess as a kid or as a teenager. It was just one of those games that looked boring and bland. A game for nerds. However in the past several years after buying my first iphone, I could not find a app that suited my needs. Ultimately I needed an game that required some strategy and would never get boring. A game that I could improve on over time and a game that would pass time while I was playing it. That game ended up being Chess. At first, I was VERY BAD at Chess, and in some ways I still am. I remember losing to a group of kids while on a cruise. After 100 or so games I realized that Chess was not so bad. In fact It became an addiction. Now here I am finally wanting to get a customized Chess board. 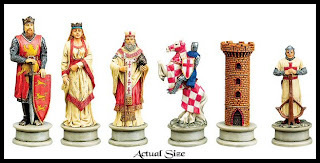 Since I am into Fantasy and Medieval characters, I thought about buying the "Crusaders Chess" set. However I want my Chess pieces to be able to be customized and I preferred my pawns to be holding shields and swords. I just could not justify the one or two hundred dollars to get this Chess set it. The pieces are nicely painted but will wear and crack and this was something I did not want. 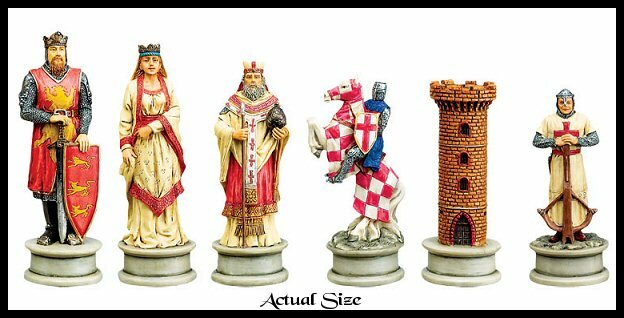 While browsing eBay, I found this this amazing chess set! The Castle Giant Lego Chess Set. Unfortunately this set was released in 2008 and is a limited edition set. It was priced at $200 back then but now fetches anywhere between $1500-1800. A fairly steep price for an Awesome set. Until Lego decides to launch another limited edition Chess set I have decided to custom make my own! Here is another set that is readily available for $50. The Kingdom Chess Set. The pieces are nice but the Chess board is small and untiled. This would mean for every move I would have to pull the piece off one section of the board and try to push it back on the desired square without the piece falling apart on me. 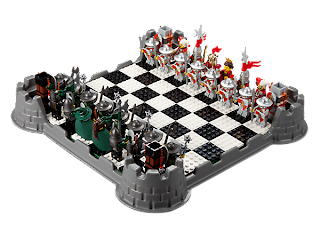 It was then I decided to build my own chess board using the "Castle Giant Lego Chess Set" as a template and even improving on the individual pieces. Budget? $200-400 And so my journey began. I scoured Bricklink and eBay and bought minifigures and all the pieces i needed. I also spent hours looking for the instruction manual on Google for the pieces from "The Kingdom Chess set". Here is the red army showing the front pawns (with the center commander pawn). The commander pawn holds a two handed battle axe and is armored. Behind them are the two wizard bishops and knights. At the rear are the two rooks. Here is an overview of the black army showing the black pawns up front with two black knights flanking the two black bishops. Behind them are two cave trolls which can be switched in for the black rooks. I thought it would be more interesting to have the black pawn army led by a single commander pawn (as the center pawns are the strongest in a game of Chess). Well - as this is made from Lego minifigures I expect them to at least hold their value. For Chess players I expect them to find this set very desirable and if I wish I may be lucky enough to find an interested buyer. 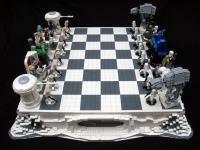 than what i would with the Giant Lego Chess Set as it is tailored to my liking. If ever I decide to have a game a Chess with a friend, i show them my Custom Lego Chess Set and it certainly becomes a focal point for discussion. That is very cool. 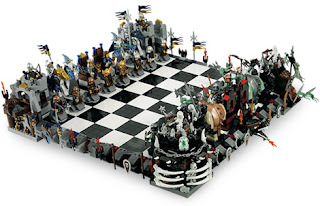 I have always wanted to make my own lego chess set. I am currently teaching my son to play, your board looks amazing. I may have to go the same route as good sets are just way to pricey.